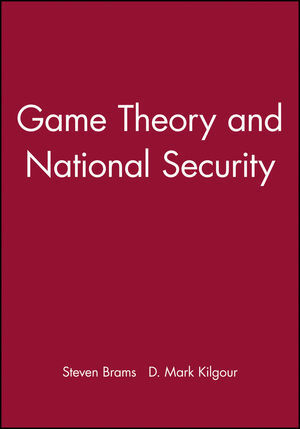 In this path-breaking theoretical work, political scientist Steven Brams and mathematician Mark Kilgour show how game theory can be applied to the rigorous development and thoughtful analysis of several critical problems that afflict the security of nations, from the deterrence of foes who might launch attacks, to the stabilization of crises that could explode into wars. In addition, they analyze a variety of related questions, including the interlocking preferences that fuel arms races, the strategic impact that Star Wars may have on nuclear deterrence, and optimal strategies for verifying arms control treaties. Of interest to students on international relations and foreign policy as well as those concerned with the formal analysis of conflict, Game Theory and National Security provides new foundations for understanding the rational basis of international conflict. Steven J. Brams is professor of politics at New York University and a leading authority in the strategic analysis of international conflict. He is the author or co-author of eight previous books, including Superpower Games and has worked for the Office of the Secretary of Defense and the Institute for Defense Analyses. D. Marc Kilgour is professor of mathematics at Wilfrid Laurier University in Waterloo, Canada, and adjunct professor of systems design engineering at the University of Waterloo.